Who lives here: A couple, their grown children and their two dogs use this home as a weekend cottage. 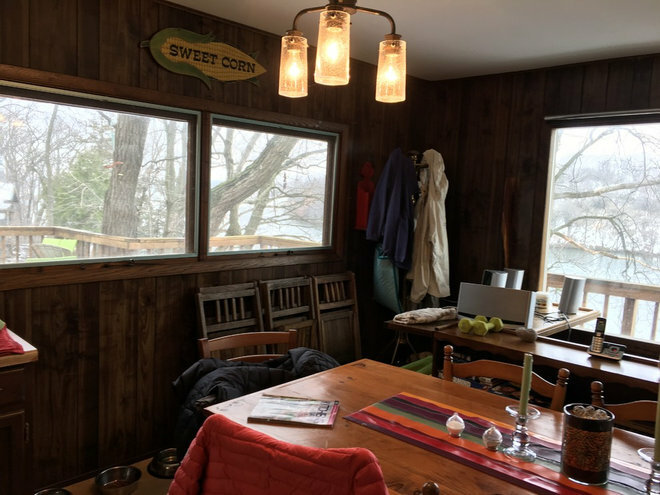 The homeowners bought their lakefront cottage in Whitewater, Wisconsin, many years ago, using it as a getaway and to host family and friends during summers and on long weekends. 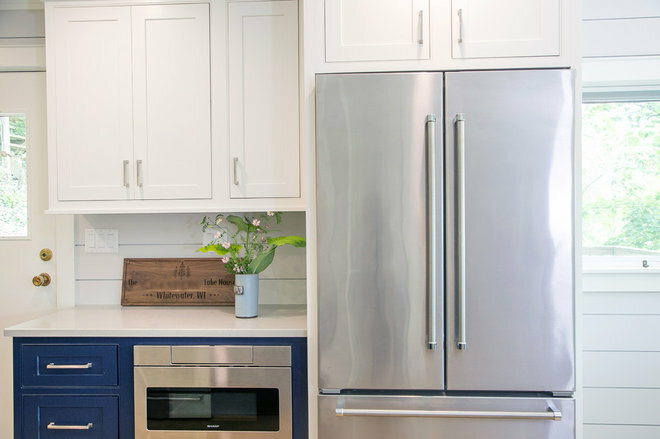 The cottage was built in the 1950s and hadn’t been updated since, so the homeowners brought in designer Natalie Spiniolas to turn the formerly dark and dated kitchen into a bright and light space. They foresee many more years of hosting family and friends, but now everyone will be gathered around the stylish new built-in banquette. 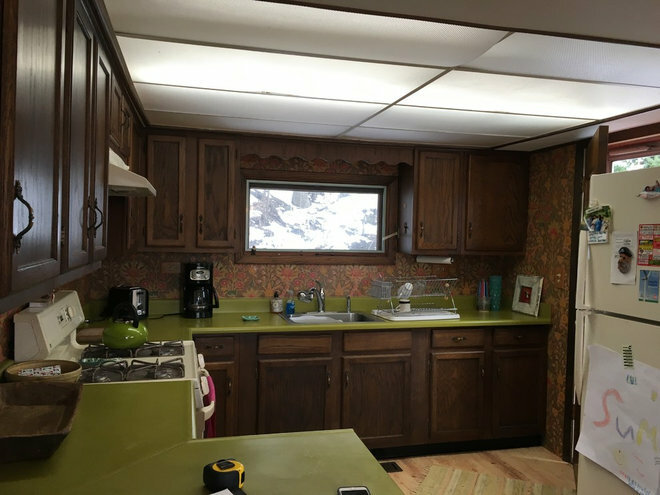 Before: The original kitchen had dark wood cabinets, avocado green laminate countertops and fluorescent overhead lighting. After: Lightening and brightening were the design objectives for the kitchen. Spiniolas had the old wallpaper removed in favor of small white marble tiles that cover the wall behind the sink and the one behind the gas range. 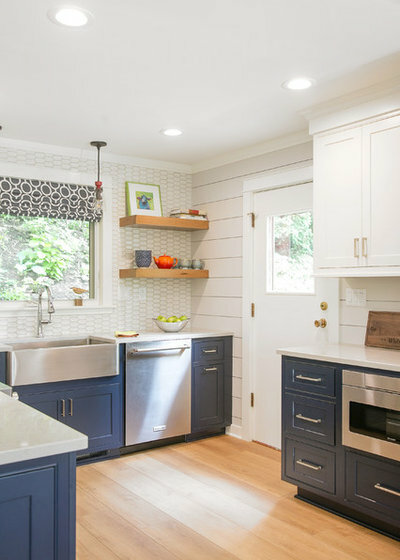 The other walls in the kitchen and dining area are now covered in a white shiplap that maintains a cottage look but feels fresh and contemporary. 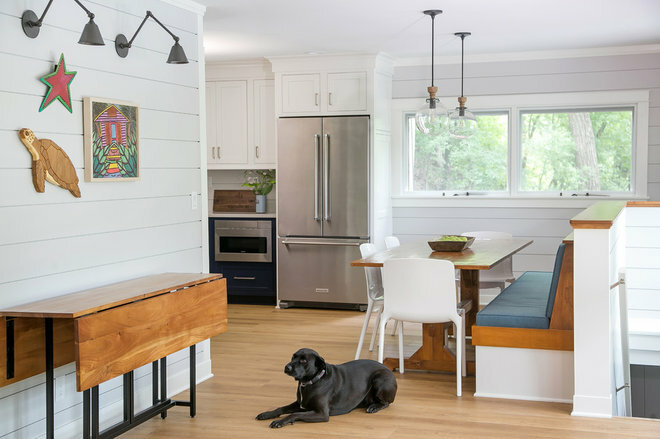 The designer removed the old dark wood cabinets and replaced them with Shaker-style cabinets. The new lower cabinets are a shade of blue, and the uppers are crisp white. Both custom colors were made using Benjamin Moore paint. Perhaps the biggest change was swapping out the old fluorescent ceiling lights for new recessed can lights. “The room has the same amount of windows and natural light, but it feels so much brighter now,” Spiniolas says. All of the new appliances and the large undermount sink are stainless steel. 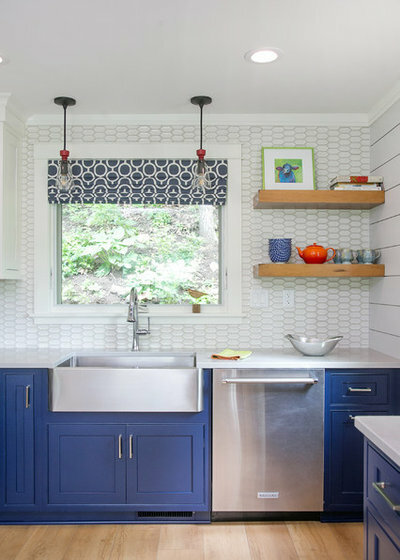 “We considered a white farmhouse sink, but we loved the way the stainless steel popped again the blue cabinets,” Spiniolas says. Not wanting to overload the room with too many cabinets, the designer opted for a pair of floating shelves made out of alder wood against the back wall. The wood adds a natural touch and helps warm up the space. Spiniolas had a stainless steel hood custom-built for the space over the range. “The homeowners didn’t want a microwave over the range,” she says. “This is a more expensive option, but it’s definitely a more classic look.” The countertops are a soft gray quartz called Georgian Bluffs from Caesarstone. 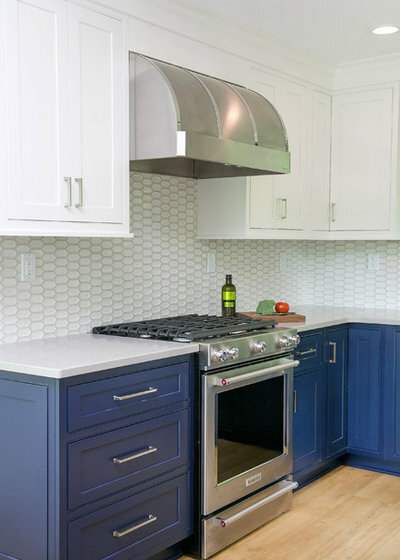 Because the homeowners didn’t want a microwave above the gas range, the designer added a microwave drawer to keep as much counter space free as possible for prep work. Before: The original dining area featured dark wood-paneled walls and an antique dining table and chairs. After: Spiniolas designed a custom banquette with bench seating that runs along the back side of the staircase railing. The bench is upholstered in a French blue indoor-outdoor fabric. The antique dining table from the previous design remains, but it is now surrounded by four white acrylic chairs that add a more contemporary feel. 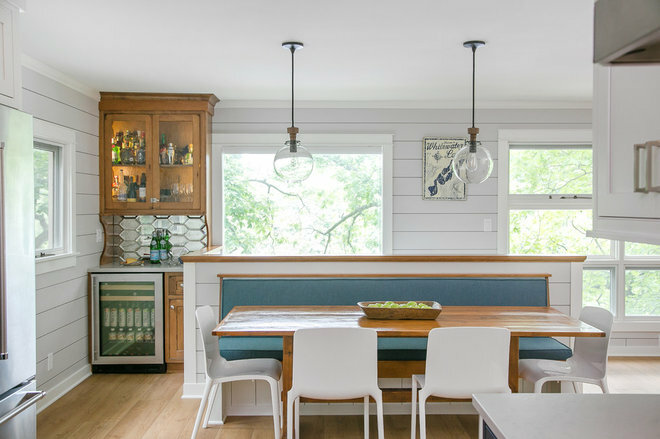 The designer repurposed an underutilized corner of the dining area by adding a custom floor-to-ceiling built-in made of alder wood. The built-in was designed to look like a piece of furniture. 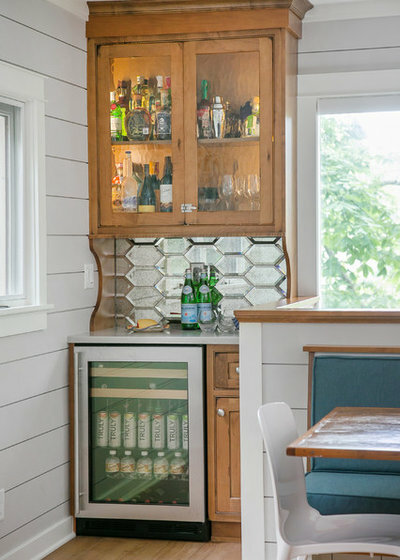 It includes a wine refrigerator at the bottom and a seeded-glass-front cabinet on top. A bar area in the center features a quartz countertop and a backsplash of antique mirrored glass tiles.